- I have mentioned Waklet or have used this in the last couple of blog posts but that is because I am a really big fan of this tool! Wakelet is a great way to curate resources. In fact I will make a Wakelet for all of these tools and share them out as well. I think that this is a great way for students and teachers to collect resources and share ideas. This is a free service for all. Several teachers in our district have been Piloting WeVideo. This is a video editing software for Chromebooks. Here is a great example from ECMS of a student created video using WeVideo. It is so great that we have our own place to show off the great things that are happening in our District! I really have enjoyed checking out the videos that you have submitted and posted. #Bluewayondisplay has been a huge success! 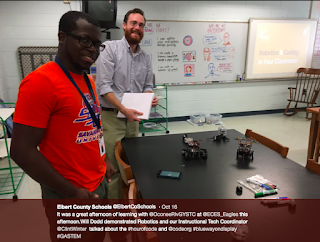 The Elbert Innovates Cohort! It was so great learning among my peers how to better integrate Chromebooks and the Google Suite in the classroom. A big shot out to Edna Eberhardt, Linda Cook, Shamiya Brown, Lisa Blackmon, Debbie Colley, Linda Cook, Devon Davis, Mitzi Faust, Connie Garrett,Sarah Rice, Angela Scoggins, Hope Slaton, and Jason Terrell. It was great to have representatives from ECPS, ECES,ECMS, and ECCHS who met a couple of times a month this year and who are vying to become Google Certified Educators. 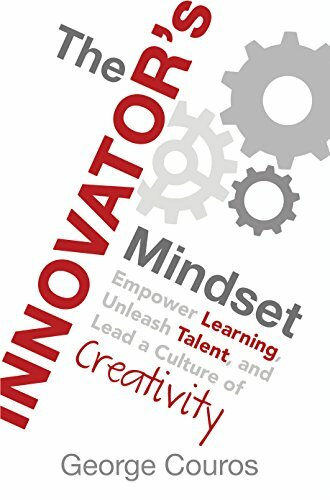 I read a few good books about creativity and inquiry in the classroom this year but this was by far my favorite. George Couros really talks about we can get the most from our students and how we can provide new learning opportunities for them. If you are interested here is a great talk from the author. He is also pretty active on Twitter and would probably even be happy to discuss further with you. This is a great tool and is currently available at ECMS and ECCHS and I believe we can check out some more at RESA. This is the definition of active learning. It was great watching Crystal Whitmire's class last week problem solve, work as a team, be creative, and try to figure out how to "Breakout" by solving puzzles to learn about coding. texthelp is the tool Equatio. Equatio makes math and STEM activities Digital. At the end of the 2017-2018 School year FlipGrid announced that the whole platform was FREE for Teachers and students. This is huge news and a great way for Teachers and students to share their voice. I keep reading about how tools like Flipgrid can give our students a voice in the classroom and beyond. EdCamp GA was one of my favorite events of 2018. It was so great learning with Teachers and Administrators from across North East Georgia. You could feel the energy as you stepped into the building. There was music playing, amazing tools and subscriptions that were given out, and most importantly sessions that you could choose from that were from teachers by teachers. Edcamp is happening again. Register soon! We are already a little over halfway full. I am excited that we have many teachers in Elbert County already signed up! I hope you have a great holiday season. If you have any questions please reach out.